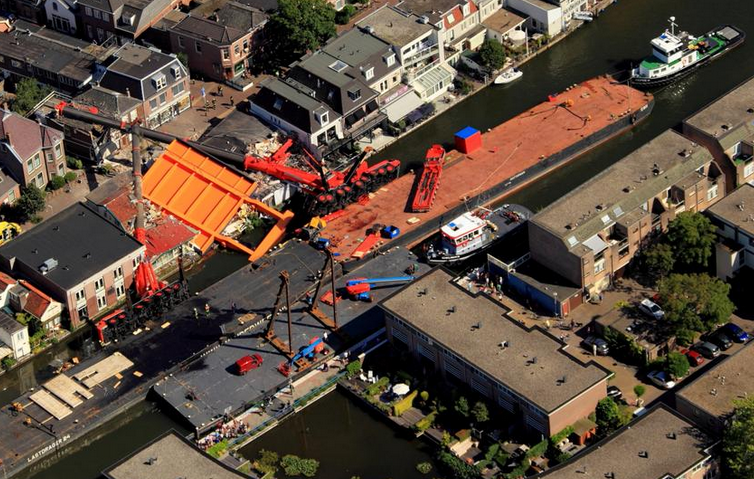 A criminal investigation is now underway into Monday’s crane accident in Alphen aan den Rijn, in which two cranes and part of a prefabricated bridge fell on several buildings, news agency ANP says on Tuesday. No one was injured when the cranes, which were standing on a pontoon on the river, began to sway and toppled onto nearby buildings, crushing several homes and shops. Three people are being treated as ‘suspects’ in the investigation. ‘It is much too soon to say if any criminal acts have taken place,’ public prosecutor Kitty Nooy told reporters. Treating the three as suspects entitles them to remain silent and to have a lawyer. Building firm Mourik, which is in charge of the bridge building process, has begun assessing how the cranes and the bridge section can be removed from the crash site. In the meantime, shipping is being rerouted to avoid this stretch of the Old Rhine, a narrow branch of the Rhine delta. Crane operator Jan Zwagerman, who applied for the Alphen project contract but did not win, said the project was doomed to fail. Officials said at first 20 people had been injured but reduced this later to one man. He had hip and leg injuries but had sustained these before the accident, mayor Liesbeth Spies told local broadcaster Studio Alphen. One dog was killed. The council is now working to ensure the worse of the rubble is cleared up and that people who were evacuated from their homes can return. This, Spies said, is the council’s first priority.